What is a Bull Flag Pattern? 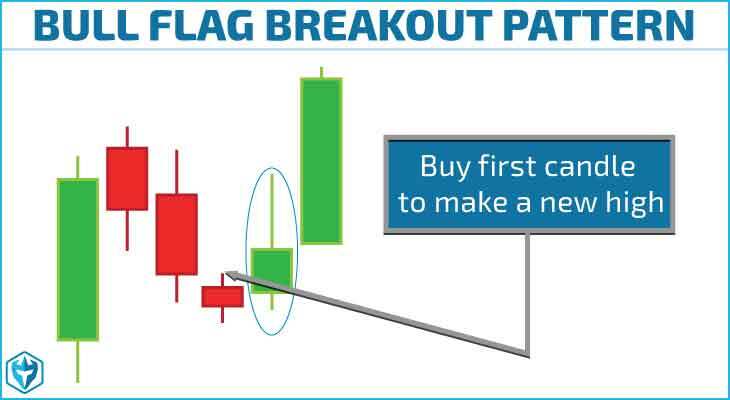 A bull flag pattern is a chart pattern that occurs when a stock is in a strong uptrend. It is called a flag pattern because when you see it on a chart it looks like a flag on a pole and since we are in an uptrend it is considered a bullish flag. Bull Flags are a subset of our momentum trading strategy and can be used on any time frame. We like trading bull flags on the 2 and 5-minute time frames as a way to scalp short-term price movements. However, they work just as good on daily charts too and are great for swing trading. Bull flag trading is fairly simple. The hardest part of trading this pattern is finding them but with scanners like Trade-Ideas you can look for stocks that are surging up and then wait for a consolidation pattern. If you’re looking for free scanners to find bull flag patterns you can check out Finviz or Chartmill. Stock is surging up on high relative volume, preferably from a news catalyst. Prices consolidate at or near highs with a defined pullback pattern. 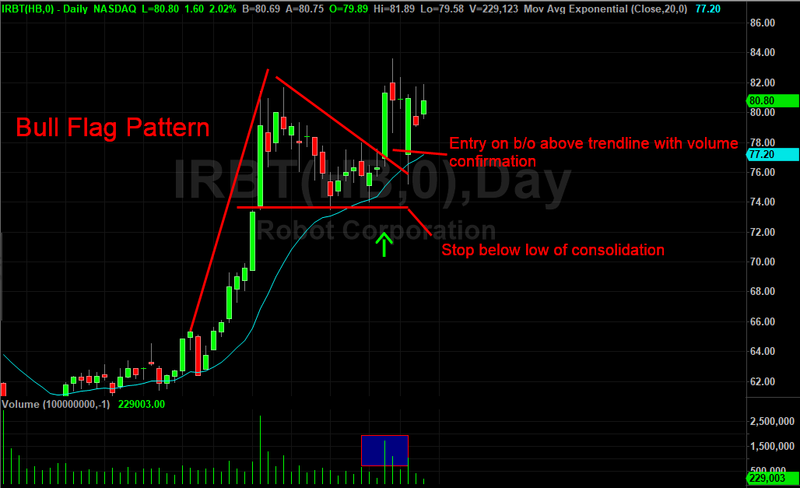 Buy when prices breakout above the consolidation pattern on high volume. Place stop order below bottom of consolidation pattern. Profit targets should be at least 2:1 risk/reward. 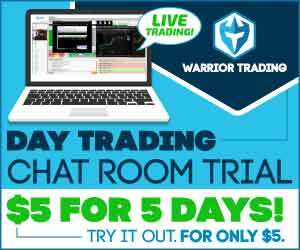 So if you are risking 25 cents, then first PT is 50 cents from your entry price. The main thing to look for in this pattern is volume. Volume confirms major moves and the likely hood that a breakout will be successful. The second thing you have to look for is a defined descending trend line that you can watch as the point of breakout. This will be the top part of the flag. In the bullish flag pattern above you can see that the trend line is very recognizable and defined so when it did finally punch through price jumped up very quickly. You can also see how neatly the line connects to the other moves up that were rejected (3 points of contact including the high of the flag pole). Bull flag patterns do have a statistical edge if traded correctly but in the event the set up fails you need to know where to get out. Or more definitively, the point on the chart where you know that this set up is no longer working out and it’s time to jump ship. There are a couple of different ways to manage this trade. The most common is to place a stop below the consolidation area. In the example above, you can see the line drawn out on the bottom of the flag pattern. This is the point where you know that this setup is no longer working out and its time to take a loss and move on. The other way is to use the 20-day moving average as a stop. So if prices close below that moving average then you would close out your position. 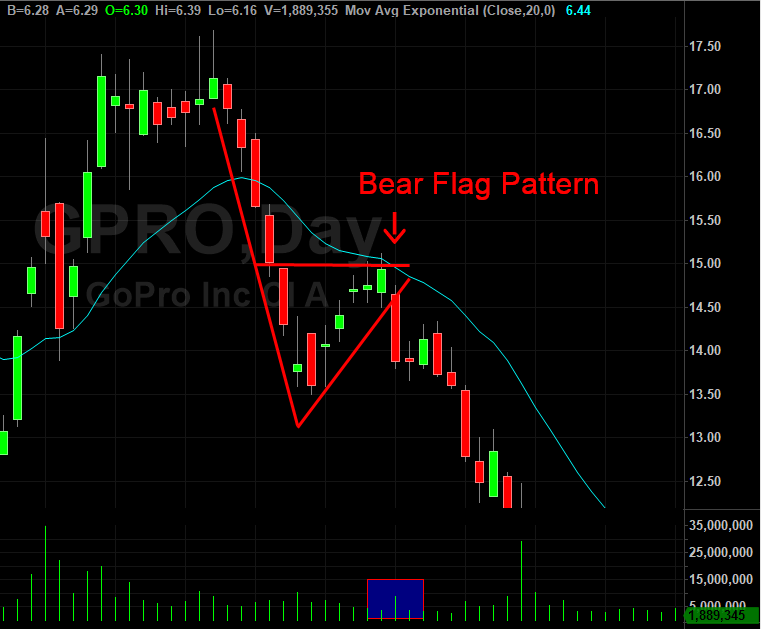 A bear flag is identical to a bull flag except the trend will be to the downside. You’ll have a sharp down move on high relative volume followed by a slight pullback before continuing on the trend. The key to trading flag patterns is following the volume. When volume comes in on the breakout, you want to be jumping on board because this is confirmation that other traders were waiting for the same thing and will increase the likelihood of success dramatically. When I trade a bull flag stock pattern, the biggest difference from a flat top breakout is that the consolidation is occurring BELOW the high. So as a flat top breakout consolidates within a few cents of the highs, a bull flag pattern experiences typically 2-3 red candles of pullback and can even pullback to the faster moving averages like the 8 or 10 EMA. If we wait to buy the highs on the bull flag, we are chasing and a proper stop (at the low of the flag) is too far away. So on a bull flag I buy the first candle to make a new high after the 2-3 red candles of pullback. I set my stop at the low of the flag which is usually pretty close by. This gives me a good risk reward ratio. If I want to double my position on the high of day break and then sell through that spike I can make a little more money. It’s important to be careful not to buy a double top. If we have a big pullback, then squeeze right back to the highs we’ll sometimes see a double top formation, or a U shape on the chart. In the examples below you will see some perfect bull flags, but you will also see some sloppier bull flags. The most important thing is that we trade bull flags on the best stocks! It’s not about trading the best pattern, it’s about trading patterns on the strongest stocks. 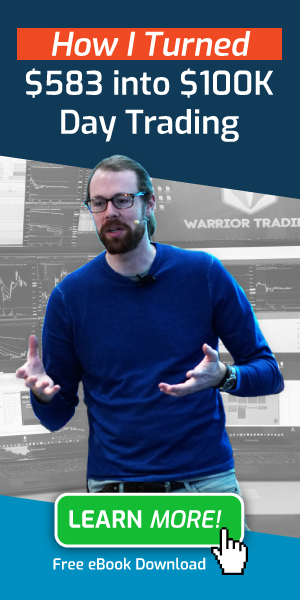 If you would like to learn more about this setup and how to trade it then make sure to sign up for our free webinar via the link below! Bull flag patterns are a great setup for new traders to learn because they are easy to spot and trade once you understand the mechanics behind them. Like most patterns, volume must be present on the breakout. This confirms the pattern and increases the likelihood that the breakout will be successful.